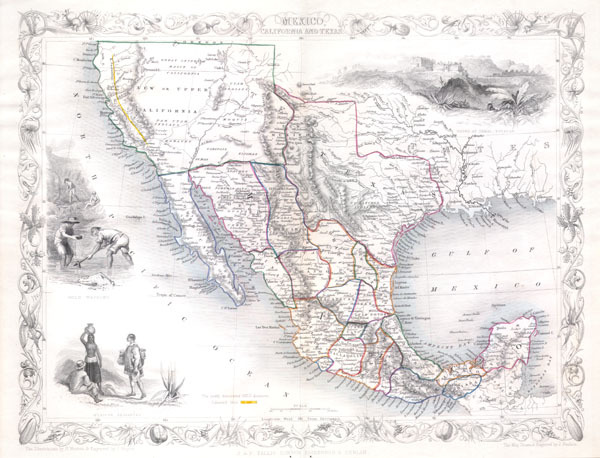 This is John Tallis's highly desirable 1851 Map of Mexico, Texas and Upper California. Herein Texas is depicted at its fullest extent including both Santa Fe and the Green Mountains. Upper California offers numerous interesting features, most specifically a colored and labeled Gold Region extending along the Sacramento River as far south as an oversized Lake Tule and Santa Cruz. The 'Great Caravan Route' used by covered wagons during the westward expansion is also noted. Offers several beautiful vignettes depicting the Ruins at Uxmal, Yucatan, panning gold in California, and Mexican Peasantry. Undated, but the defined gold regions allows us to identify this as the 1851 issued of Tallis's valuable map.